Alison:Did you know that its Starbucks Holiday Coffee Season? Susie: No…I didn’t know there was a coffee season. Alison:Well it is! We absolutely love all things coffee at my house, so we headed out to Sam’s to see if they had some. Even though we use lots of coupons when shopping, coffee is typically something you never find a great deal on. Susie:I think you mean never. Alison:For this reason we try to find coffee brands we love at stores like Sam’s because they’re a much better deal. I mean where else can you pick up a 28 oz. 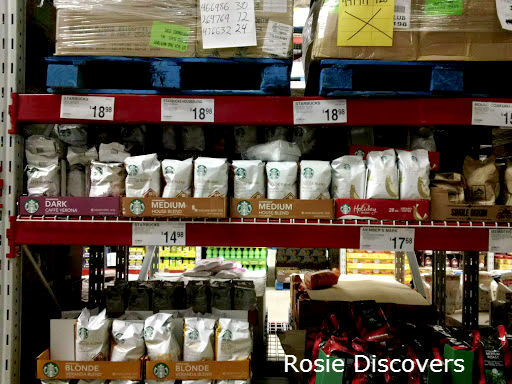 bag of Starbucks coffee for $18.98? Susie: I can’t think of anywhere. Unless of course you travel straight to the source. But that would include airfare and most likely a strange journey with donkeys or some other stinky animal. Alison: Uhhh…I think you over thought that one. Susie: Says the person who’ll end up on a donkey. Alison: That will never happen. Another reason I wanted to pick up the Starbucks holiday blend was to use it as a little treat for the Prayer Shawl group over at Our Lady of the Wayside since November 15th was National Philanthropy day. They knit and crochet shawls for those in need. Their annual bazaar is coming up this weekend, November 17th, and I wanted them to have a little treat for all their hard work. Susie: It’s true. They are quite amazing. I mean, not many people knit and crochet in such quantities. Alison:I expected to see a huge holiday Starbucks display, but there was only this sad little box of holiday coffee in the coffee aisle. Susie: I know, it’s more of a sad shelf. Alison:I didn’t see any other holiday coffee displays either. 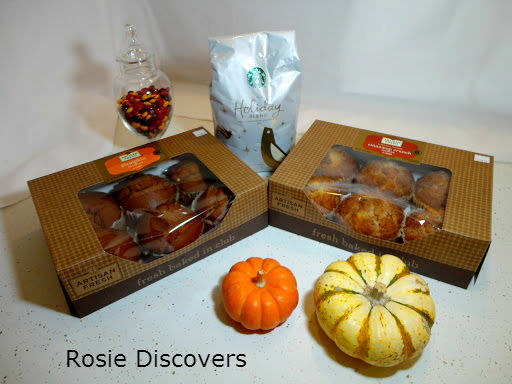 Alison:I also picked up some pumpkin and cinnamon muffins to make it more of a #DeliciousPairings coffee klatch for the volunteers. Susie: Muffins. They remind me of puffins, except you know with a P instead of an M. Puffins are so cute! Susie: Plus puffins remind me of all sorts of holiday decorations and cartoons! 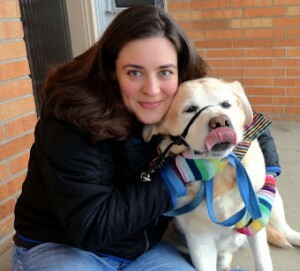 Alison:As you can see, I’m not the only one who loves a great holiday blend! 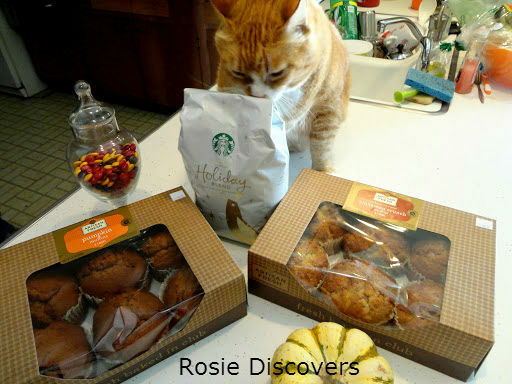 Seven decided to love the bag while I was setting up my Starbucks Holiday coffee spread. Susie: He is well trained. There’s a reason he’s the favorite. He has great taste! Alison:No one can resist coffee in our house. The proof is in the sniffing. Susie: *deep inhale* I don’t smell any coffee. Alison: It’s not coffee time. You had coffee this morning! Susie: What? I can’t have more? Alison: Not right now! While I do love lattes, I also love a great cup of coffee at home. I tend to pick artisan roasted coffees as I love all the flavors you get in a cup. Susie: More accurately a whole pot. One cup is not enough. 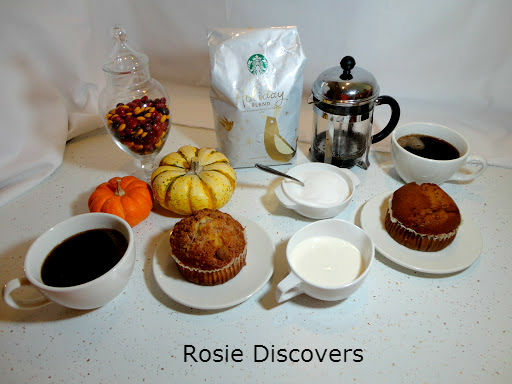 Alison: I do love a holiday blend as it has great flavor notes such as cinnamon, nutmeg and ginger. Picking up a bag this size is always a great idea if you love to brew your coffee at home like we do. Susie: We almost always use a french press to make coffee as it allows all the great tasting oils to shine through flavor-wise. Alison: I typically find Starbucks coffee to be a little strong tasting. Susie:That’s one way of putting it. Dark might be another. 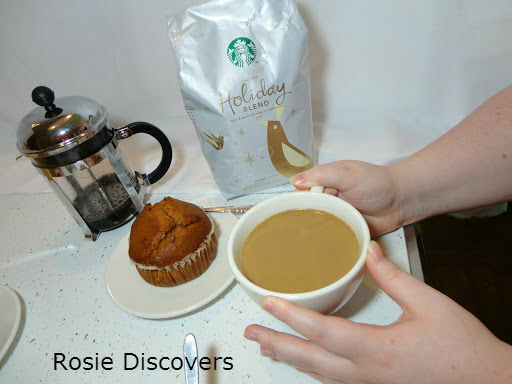 Alison: But the holiday blend was surprisingly tasty with a little cream and sugar added. First, we tried the coffee alone. Susie: Then we quickly mixed until our lips no longer puckered. Alison:My sister and I definitely noticed a holiday spice taste. Susie: Which is a good thing, or else that’d be one lame holiday blend. Alison:Next we tried the muffins, I had the cinnamon. Susie: I had the pumpkin. Alison:Then, it was time to see if they brought out extra flavor notes in the coffee. Susie: Surprisingly, they did! 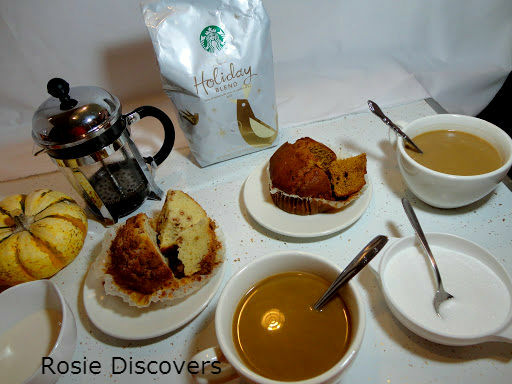 After tasting a treat containing similar flavors brought out the cinnamon, nutmeg and ginger notes in the Starbucks holiday blend. 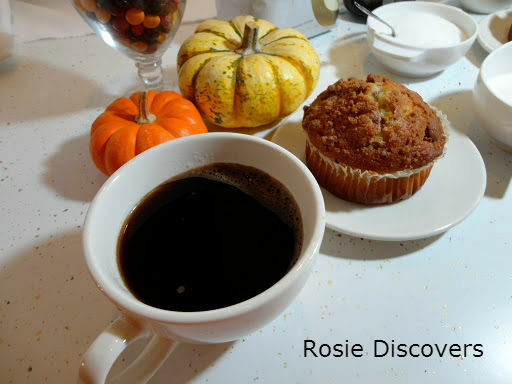 Alison:This afternoon I brought the coffee and muffins over to the Prayer Shawl group. The ladies over there love coffee and treats. Susie: Heck, who doesn’t love coffee and treats? Probably that donkey carrying all that coffee. Alison:They were excited to get to try them. Most commented how much better the coffee tasted after they’d tried the treats. The huge bag of Starbucks holiday coffee will last them well into the new year! Susie: They like to savor their coffee. Alison:Sam’s Club will open at 7 am on Black Friday and will greet members with free Starbucks Holiday Blend coffee and Artisan Fresh pastries (while supplies last). Susie: Coffee? Can I have some coffee now? Alison: I don’t see why not! LOL I love these posts, they are so much fun. And I want a freakin' muffin, man!